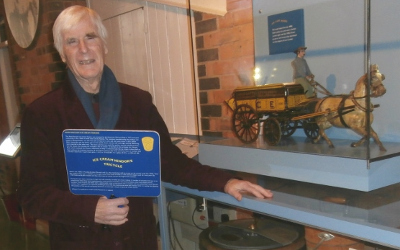 I RECENTLY visited the London Canal Museum for the first time, writes Alan Tilbury. 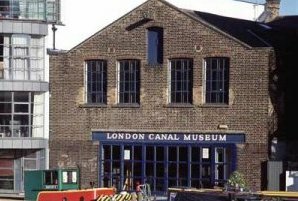 The museum was opened in 1992 and is situated a few minutes walk from Kings Cross Station in New Wharf Road. It is housed in a Victorian ice warehouse that was used by Carlo Gatti. The building was constructed between 1862 and 1863 to house ice imported from Norway by ship and canal barge. There are two preserved ice wells under the building, one of which may be viewed from the public area of the museum. The open ice well is located at the rear of the ground floor, no longer 42 ft deep having been filled in leaving a depth of about 10ft on show. Because of its association with Calo Gattie renowned for introducing ice cream to the masses a large section of the downstairs area is devoted to his achievements. 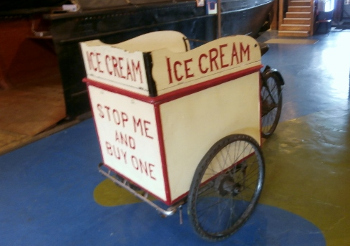 Displays of his equipment include glass licking cups; before edible cones were developed ice cream was served in small glass cups and customers licked the ice cream. Behind the ice well is a display cabinet of Measham pottery along with lace plates. 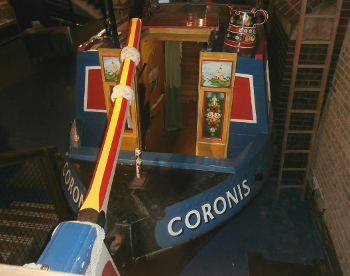 On the ground floor is the stern section of narrowboat Corinos that you can climb aboard and explore. It still amazes me as to how, often large families were raised in such confined conditions. Climbing a few stairs takes you to the access to Battlebridge Basin just off the Regents Canal. The museum has a Bantam Tug, a pusher vessel built in late 1949 but it wasn’t there on my visit. As you enter the building with various artefacts distributed around the main exhibitions and there is a shop selling books and souvenirs. There is a closed-off horse ramp to the upper floor but visitors have use of stairs or a lift. 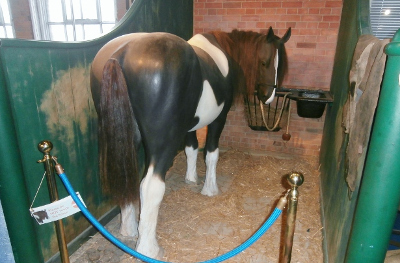 As horse power reigned in the early canal days a large section of the first floor is dedicated to horses and their essential equipment to keep them operational. The stable scene is a replica of an original on site in 1906. Due to shortage of space in London, stables were often on the first floor of buildings, hence the ramp from the ground floor. Much of this floor has photo displays of not only the London canals but also the rivers Lee (or Lea) and Stort taken in the distant past. There is a video of the development of the London canals and the development and operation of locks first developed by the Dutch. There is a large notice board explaining how important the lock keepers were in maintaining water levels as well as keeping boats moving efficiently through the system. Maybe CaRT should have a rethink on this subject. 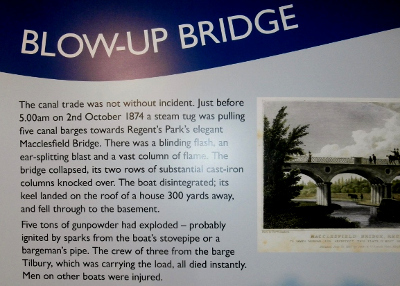 Another large display board described the tragic event of the Blow-up Bridge on the Regents Canal. Although aware of this happening it was the name of the Tug involved ‘Tilbury’ that caught my eye! There was an action model of how a lock works which of course I had to play with but there essentially for the groups of school children that frequently visit. Regular activities take place throughout the year including short boat trips. A large map on the wall shows the present and long gone London canals, had they still been in existence, they would have equalled the numerous canals of Birmingham making some interesting cruising routes. 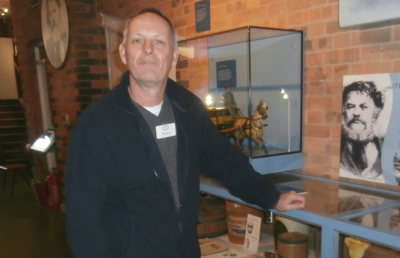 The museum is run solely by volunteers, on duty the day of my visit were John and Richard. John specialises in the historic side of the canals while Richard is a recent volunteer and is a narrowboat owner with his boat based in the Northampton area. This is a compact friendly museum with a range of canal paraphernalia strategically placed on both floors. You can even get married there! Although a cold winters day when I visited there was a steady stream of people coming and going. Some events are coming up at the museum. Wednesday 5th December at 16:45—The Birth of the Refrigeration Industry in London 1850 to 1900. Thursday 6th December at 19:30—Illustrated Talk: Islington Tunnel. Wednesday 12th December at 18:00—Sustain AGM and Annual Gathering, 2018. Alan's photograph show John (above) and Richard.